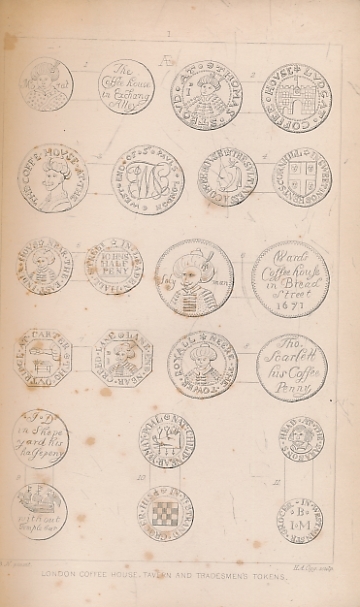 Barter Books : Akerman, John Yonge : Tradesmen's Tokens Current in London and its Vicinity between the Years 1648 and 1672. Signed copy. 230 x 160 mm (9 x 6 inches) - viii, 257pp + plates. Dark green hardback cloth cover. Worn condition. Front board detached. Cover rubbed with loss to spine. Some foxing. Content in overall good condition. Signed and dedicated by author on title page as follows:' John Lindsay Esq, Cork with the best compliments of the compiler London, Apr. 26. 1849, J. W. Akerman'.